For the past few years, Adviso has been using an increasingly refined model to predict cost per acquisition (CPA) for our clients: the Delta Opportunity Index (DOI for those in the know). The model’s ingredients are simple: demand, marketing spend and revenue generated, but the results have proven remarkably accurate for each analysis we’ve conducted. It’s a recurring question and an obsession we share with the majority of our clients: what’s the ideal amount to spend to make sure you’re able to reach your goal and maintain an acceptable cost per acquisition? Too often, budgeting is done based on internal data (historical marketing budget, planned/desired sales for the next period, etc. ), with little to no input from external data. The DOI aims to fix this problem by applying predictive data from reliable external sources to the analysis. This allows us to create a budget that takes into account the ecosystem within which the company or product exists. Budgets are usually subject to several modifications over the course of the year, as emergencies come up and results are either achieved or not. The consequence? Over-investment during critical times for the company, and lack of budget at other times. The word “ideal” represents the most favourable state. Within the framework of a sales or new customer acquisition program, “ideal” means closing as many sales as possible while taking into account the budget available for acquisition. To make this happen, it’s important to keep the cost per sale or CPA as low as possible. We’ve seen that when the curve of your marketing expenses perfectly matches the curve of consumer demand, the CPA will be at its very lowest point, and the cost, therefore, will be ideal. It’s like surfing a wave instead of trying to paddle against the current. When you surf the wave of demand, everything stays in balance and the momentum of the wave drives you. When you paddle against the current, you over-invest in an attempt to break through trends that are working against you. The result is a very high CPA and dollars that won’t be available later in the period to surf the wave and benefit from a better CPA. The principle of the DOI is most effective and relevant in a low-funnel or conversion context where the goal of your investment is to earn an immediate, measurable action. You need to capitalize on everything related to intentions. 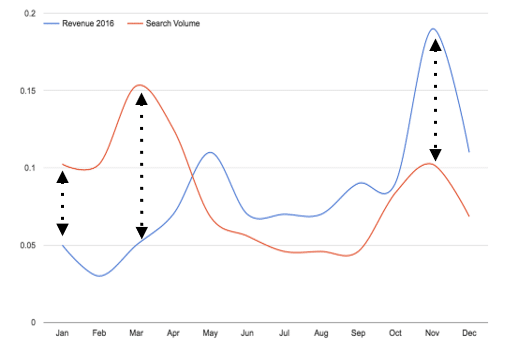 Search intentions in absolute numbers (data from Google), consumer intentions via social media mentions and other more traditional data sources (daily inbound calls to sales or visits to stores). The challenge is to identify all the data and categorize it (brand, competition, product, category, geography, etc.) to get an accurate picture. Here, you need to compile all the expenses relevant to your DOI. If you want an e-commerce DOI, you need to collect digital expenses: Google Ads, Facebook, the DSP (programmatic buys, often Doubleclick) for example. If you want a more omnichannel DOI, you need to add other promotional investments with a lower funnel call to action, for example promotions on a product or category. You can find revenue originating from digital channels in Google Analytics (if it’s properly captured and organized) or in the company’s accounting system for more traditional channels (in-store, call center, etc.). In an ideal world, revenue from digital channels would be separate from other channels, but the DOI will still work if all the channels are grouped together. In the end, a DOI is just a covarience analysis that harnesses all these elements. Here’s what your DOI might look like. The dissonance zone allows you to quickly visualize where you under-invested and over-invested in the past, so you don’t repeat those errors in the future. 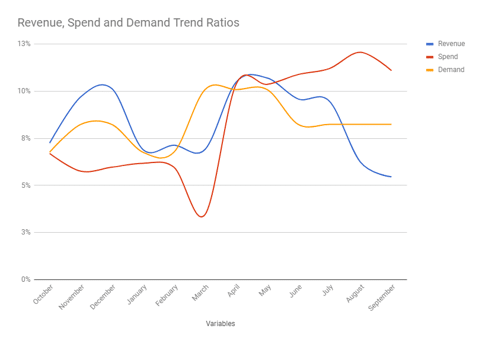 Once the low-funnel is optimized and the budget is perfectly lined up, it’s time to look at how you can change the demand curve. You can take an approach that maximizes reach and increases consumers love for the brand, or amplifies demand for the entire category. More to come on that in the next article!